Its better to wander into this film without knowing too much. 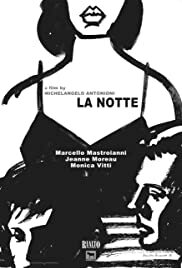 The performances are all outstanding but the main credit must be handed to the artist behind it all Michelangelo Antonioni. It would have been quite beautiful to have seen this film when it came out, but even after all these years the themes still resonate as true. I don't want to get into the plot too much, but this film is more about feeling. The friction and differences between husband and wife are explored. Antonioni doesn't force anything, he allows a scene to play out in proper time. This film is full of symbolism and despair.